An 88-year-old woman was admitted to the emergency department of our hospital with an itchy skin rash that developed while she was on antibiotics (quinolones), administered for an episode of acute cystitis, asthenia and fever. She was suspected to have an allergic reaction and treated with i.v. methylprednisolone 40 mg per day. After 24 hours, skin rash and fever had subsided and the woman was normally oriented, easily breathing in the supine position, without peripheral oedema. A pneumologist consultation was requested by the internal medicine ward because the patient had a history of chronic obstructive pulmonary disease (COPD), and very low oxygen saturation while breathing oxygen 1 L·min−1 through a nasal cannula. On clinical examination, she presented cyanosis and a marked reduction of muscle mass. The chest examination was consistent with the diagnosis of COPD. Respiratory rate was 25 beats·min−1 while breathing air and without paradox breathing at rest. She reported moderate dyspnoea while walking. Arterial blood pressure and cardiac frequency were 140/70 mmHg and 85 beats·min−1, respectively. The oxygen saturation, captured from one finger with a pulse oximeter while breathing air was 81%. It was stable and did not change when the finger or the probe was changed. What is the first action of your choice in this situation? We need to both increase the oxygen content of blood and the oxygen delivery to the tissues and to detect which kind of respiratory failure we are facing. As previously mentioned, the patient had a history of COPD. An excess of oxygen concentration in the breathing mixture can reduce the hypoxic drive to ventilation. In COPD patients with inadequate removal of CO2 from alveoli because of both severe airflow limitation and inadequate alveolar ventilation (hypercapnic COPD), some reduction of ventilation may cause an acute respiratory acidosis. Thus, it is worth measuring the characteristics of respiratory failure of those patients. An arterial blood gas sample was obtained and, while waiting for the results of gas analysis, oxygen was administered through a Venturi mask, initially at an inspiratory oxygen fraction (FIO2) of 0.28, in order to increase the haemoglobin saturation. Surprisingly, the 88% saturation (SpO2) obtained by using a FIO2 of 0.40 did not increase any further using higher FIO2 up to 0.60 and, finally, also by breathing pure oxygen. What is the possible explanation of this finding? A right-to-left shunt is a plausible explanation, when a low oxygen saturation is persistent in a subject breathing pure oxygen. A true right-to-left shunt occurs when venous blood can mix with arterial blood because of congenital or acquired conditions like intra-cardiac communications or central large vessels communications. Other pathologic conditions can determine a true right-to-left shunt, such as consolidated areas in which perfusion but not ventilation is allowed or the opening of a right to left shunt due to an increase of the pulmonary vascular resistance caused by a massive embolism. A peripheral pulmonary embolism without lung infarction abolishes the perfusion of the involved area (prevailing ventilation), but it also determines re-distribution of bloodstream in other lung districts (prevailing perfusion) and the severity of the hypoxaemia is related to the extension and V′/Q′ ratio of the involved area. Increasing ventilation of pulmonary areas with low V′/Q′ ratio (recruitment of hypo-ventilated zones) or a higher concentration of oxygen in those areas may increase the haemoglobin saturation provided that no direct alterations of alveolar-capillary gas exchanges are present. Actually, in all COPD patients, hypoxia due to lung areas with an excess of V′/Q′ ratio mismatch can be corrected by increasing the alveolar partial pressure of oxygen. In our case, the medical history was negative for diagnosis and symptoms that could be associated with a right-to-left shunt. Moreover, the chest radiograph demonstrated only signs of the already-known COPD and an exacerbation could be excluded on the basis of the recent history. There was also a history of, the medical history reported a myocardial infarction 10 years before, an episode of temporal arteritis with residual left eye amaurosis, and a femoral fracture treated with a hip prosthesis, followed by a long period in bed during the past two months. The possible opening of a right-to-left shunt due to an increase of the pulmonary vascular resistance caused by a massive embolism was suggested by that history although symptoms of pulmonary embolism were not reported. When a low probability pulmonary embolism is suspected, what is the preferred work out strategy? If there is a very low probability of pulmonary embolism, a negative D-dimer test can rule out the diagnosis of pulmonary embolism. In our case, the D-dimer was negative . However, a VUS was performed later in this patient and the result was negative. In the meantime, an arterial blood gas sample was ready. The gas pressures were: arterial oxygen pressure (PaO2): 56.3 mmHg; arterial carbon dioxide pressure (PaCO2): 34.8 mmHg; and pH: 7.43, while breathing air. In the second sample, while breathing oxygen at an FIO2 of 0.40, the gas pressures were: PaO2: 116 mmHg; PaCO2: 34.4 mmHg; and pH: 7.43. Both samples showed hypocapnia and mild respiratory alkalosis because of adequate chronic hyperventilation in response to tissues hypoxia and this has made us aware of non-hypercapnic COPD conditions (adequate ventilation) of the patient. The hypothesis of a right-to-left shunt is not consistent with the observed increase of PaO2 while breathing an oxygen-enriched mixture and PaO2 >100 mmHg should determine an arterial oxyhaemoglobin (HbO2) close to 100%. Moreover, the satisfactory accuracy of the noninvasive measurement of HbO2 (i.e. SpO2 captured by pulse oximeter) was confirmed by gas analysis being the amount of HbO2: 78% and 86% in the first and second sample, respectively. Do you perceive anything unusual? It was also unusual that a PaO2 of 56,3 mmHg at the first sample could match with SpO2: 81% measured by pulse oximeter. In both conditions (first and second sample), it is possible to note the differences between PaO2 and SpO2. PaO2 is directly related to the alveolar pressure of oxygen (PaO2) and depends on the alveolar-capillary diffusion. SpO2 represents the amount of Hb linked to oxygen. CaO2 and therefore the delivery of oxygen to tissues maximally, depends on the amount of haemoglobin and on oxygen saturation of haemoglobin. However PaO2 close to 100 mmHg in normal conditions determines SpO2 close to 100%. What is the possible explanation of the contrasting results in our patient? Actually in both samples the methaemoglobin level was around 11%. Methaemoglobinaemia is an unusual and potentially fatal condition in which haemoglobin is oxidised to methaemoglobin and loses its ability to bind and transport oxygen. 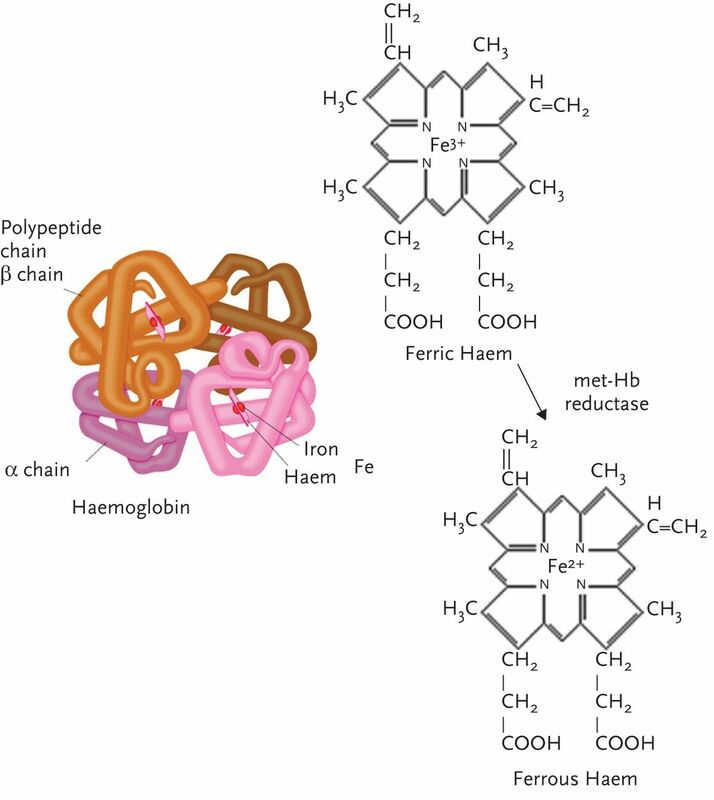 In detail, methaemoglobin is a form of the oxygen-carrying protein haemoglobin characterised by the iron in the haem group in the Fe3+ (ferric) and not in the Fe2+ (ferrous) state as in the normal haemoglobin (fig. 1). Normally red cells are constantly exposed to oxidant stress and haemoglobin is constantly oxidised to methaemoglobin. The control of the iron oxidative state of haemoglobin requires two intrinsic mechanisms: an enzymatic system and a non-enzymatic system of endogenous reducing agents. In the enzymatic system, two direct methaemoglobin reductases are involved: the nicotinamide adenine dinucleotide (NADH)-dependent methaemoglobin reductase (95–99% of the daily reduction) and the nicotinamide adenine dinucleotide phosphate (NADPH)-dependent methaemoglobin reductase. The homozygous state of these enzymes deficiency causes congenital methaemoglobinemia. In the non-enzymatic system, endogenous reducing agents, such as glutathione and ascorbic acid with their anti-oxidative power indirectly prevent formation. Either a decrease in enzymatic reduction activity or/and an increase in oxidising stress such as drug/toxic exposure can lead to methaemoglobinaemia  (table 1). How to discover the cause of methaemoglobinaemia? In this patient methaemoglobinemia was not a genetic condition. The increased values of liver transaminase (up to 300 U·L−1) and of lactate dehydrogenase (LDH up to 700 U·L−1), with normal values of indices of biliary system pathology, strongly suggested a toxic cause. Therefore we investigated a detailed pharmacological and alimentary history. No unusual foods had been eaten in the last days or weeks. At the time of Emergency Department admission she was on long term tiotropium bromide, digoxin, carvedilol, acetylsalicylate and nitro-glycerine transdermic system. In addition to this chronic therapy she had taken two doses of pefloxacine, the likely cause of the itchy skin rash that caused the hospital admission. None of these drugs can cause methaemoglobinemia. We asked the patient's daughter about any new drugs administered in the past weeks and she replied that she had been administered for the last 15 days a non-standardized formulation drug prepared by pharmacist and prescribed by an ophthalmologist for a corneal disorder. This drug was dapsone, prescribed 75 mg twice a day p.o. for the treatment of an ocular pemphigoid. We found in the literature some cases of methaemoglobinemia due to dapsone administration [3, 4]. What is the treatment of methaemoglobinaemia? Toxic methaemoglobinaemia is due to a mechanism of oxidation of haemoglobin iron which is then unable to bind oxygen. Therapy is based on the removal of the toxic substance, the administration of anti-oxidative drugs and, if cyanosis and severe respiratory failure appear, hyperbaric administration of oxygen or methylene blue intravenously. In our patient, the administration of dapsone was immediately discontinued. The patient was administered oxygen through a Venturi-system at 28% FIO2 and her blood levels of methaemoglobin were monitored through arterial blood gas samplings. She was given antioxidant therapy with administration of glutathione and ascorbic acid intravenously. The levels of methaemoglobin halved after 4 days of therapy. No other therapy, such as hyperbaric administration of oxygen or intravenous methylene blue, was administered because of the absence of cyanosis and the constant reduction of methaemoglobin blood levels with the interruption of the administration of dapsone and with the antioxidant therapy. table 2 shows the relationships between methaemoglobin levels and clinical signs and symptoms. The patient was discharged 7 days later in good clinical conditions. At discharge, the gas analysis while breathing air was: PaO2: 63.4 mmHg; PaCO2: 34.8 mmHg; pH: 7.44; and methaemoglobin: 2.5%. We monitored her methaemoglobin levels with arterial blood gas sampling 7 days later and it was 1.5%. The final diagnosis was: allergic reaction to pefloxacine, COPD with hypoxia and dapsone toxicity with methaemoglobinaemia. We may add that there is no evidence in the literature about any interaction of pefloxacine and dapsone as determinants of methaemoglobinaemia.
. Evidence-based diagnostic algorithms for pulmonary embolism: why are they necessary? Eur Respir Monogr 2003; 27: 165–176.
. Nitrite-induced methaemoglobinaemia: aetiology, diagnosis and treatment. Anaesthesia 2005; 60: 496–500.
. Drug-induced methaemoglobinaemia. Treatment issues. Drug Saf 1996; 14: 394–405.
. Unexplained acute severe methaemoglobinaemia in a young adult. Br J Anaesth 2001; 86: 278–280.